Located at the ECC gate 1, the ECC Career Lounge has opened to help support students find their dreams. Photo by Park Jae-won. 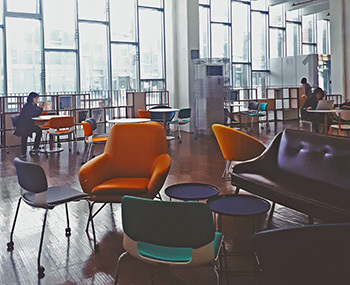 The lounge consists of three parts; Nae:il Box, Nae:il Café, and Nae:ilConsulting, where students can gain helpful advices. Photo by Park Jae-won. After several months of the school contemplating on ways to foster a stronger community for those seeking employment and entrepreneurship, the ECC Career Lounge opened on Jan. 17, revealing its new look of the ECC gate 1. 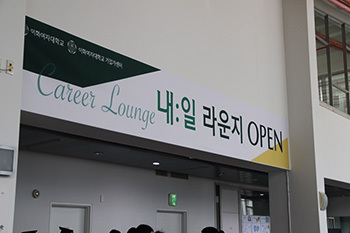 The ECC Career Lounge, also known as “Nae:il Lounge” translates into both words, “tomorrow” and “my job,” which shows the purpose of the lounge; being prepared for tomorrow and finding one’s career. The Center for Entrepreneurship and Career Development Center started the project last September, after acknowledging the need for a support system of students seeking for employment and startups. In the hopes to help provide the students with diverse networks and more job opportunities, the Center for Entrepreneurship organized the lounge into three parts: Nae:il Box, Nae:il Café, and Nae:il Consulting. Nae:il Box is a creative cube equipped with high-tech facilities such as the digital signage and, an electronic display where students can check on job information and reservation status of the school’s job consultation. On each side, there are several booths and tables that plan to be used during job fairs or company presentations. The tables are also opened to school startup clubs when holding mentoring events regarding entrepreneurship. For the Nae:il Consulting section, one-on-one job consultations, seminars, and open spaces for small groups are provided. While the Nae:il Café is more of an interacting space, it also offers students with useful advices and key information of the job market through a huge multi- vision and upcoming gatherings. The videos that appear in the multi-vision are stories behind successful startups and contents dealing with the trends of the industry. The center plans to showcase videos on unique business ideas made by students after thorough examination. Although the center ambitiously set up a career lounge for job-seeking students, there are some complaints regarding the location selection and concerns of confusion among students. Also, a junior majoring in English Language & Literature, pointed out that the ECC gate 1 used to be an autonomous space for students, especially an essential venue for carrying out team projects and a meeting spot for most students. But with the new lounge, there are now less space for students to meet up and work for group projects. For this issue, the manager of the Center for Entrepreneurship explained that the gate 1 was chosen for ECC Career Lounge due to high accessibility. The center lastly commented on the prospects of the Career Lounge and how it will support students looking for help.